I recently talked about sharing Instagram videos on Vine, a multi-step procedure that involves a third-party app to save an Instagram clip to the Camera roll before posting it manually to the Twitter-owned Vine service. But what about the other way round? Of course that same process applies to posting vine clips on Instagram: save a vine to the device before manually sharing it on Instagram. As it turns out, there’s a bunch of third-party apps in the App Store which can take the pain out of resharing vines on Instagram. With VineGrab, a free iPhone app by Xiaoyu Xia, not only can you watch vines in a more elegant interface than Vine’s own, you can also repost your favorite ones to Instagram. 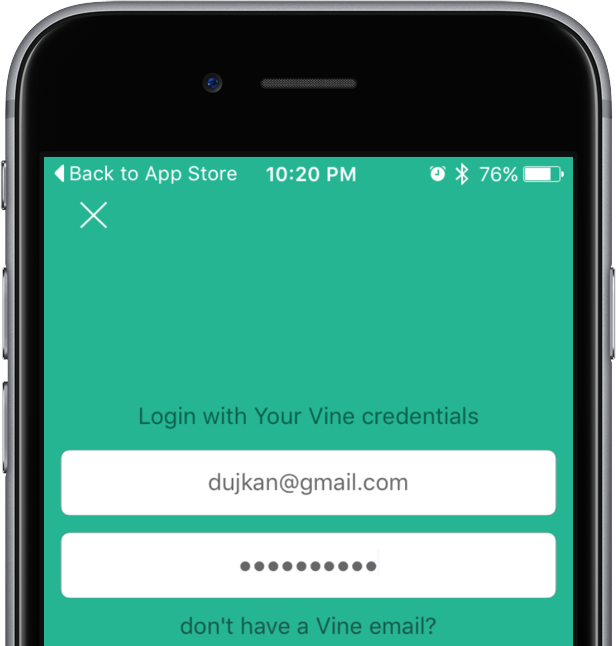 Before we get to the step-by-step instructions, the app requires you to use the email associated with your Vine account to log in. If you use your Vine user name and not the email associated with your Vine account, VineGrab will return an error. Logging in with your Twitter account is supported, too. You can download VineGrab at no charge in the App Store. 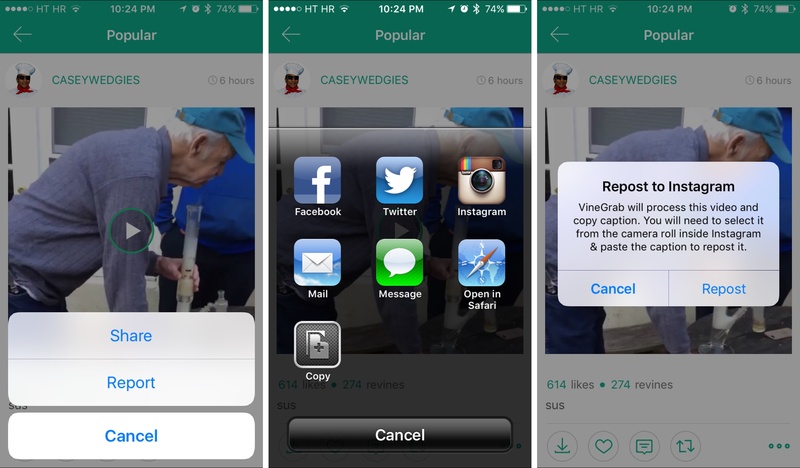 Like many other Vine apps, VineGrab uses virtual coins that limit how many videos you can repost. The free version gives you five free coins and more are available via the In-App Purchase mechanism: 10 coins for $1.99 or 50 coins for $4.99. 1) Launch VineGrab and provide your user name and password when asked, or tap the Twitter button to log in to Vine with your Twitter account. 2) Find something worth resharing. In the side menu, select your own feed, browse Popular and Explore feeds or tap the Search option to find vines by people and tags. 3) Now tap a vine you’d like to repost on Instagram. 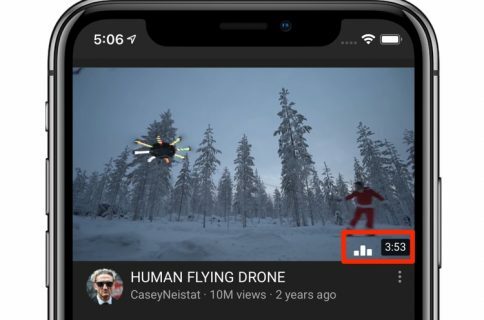 4) On the video preview screen, tap the ellipsis icon in the lower-right corner of the interface, then select the Share option in the pop-up menu. 5) Up pops an overlay with a grid of iOS 6-style icons for the supported share services. Tap the Instagram icon to continue. A dialog is shown, warning you that the app will first download the vine to your Camera roll, then take you to the Instagram app to continue sharing. 6) After the download process completes, you’ll be taken to the Instagram app with your Camera roll shown. Tap your downloaded vine and then hit Next to continue. You may need to tap Library at the bottom if your photo library does not show up by default. 7) On the next screen, choose a filter to optionally pretty up your vine. 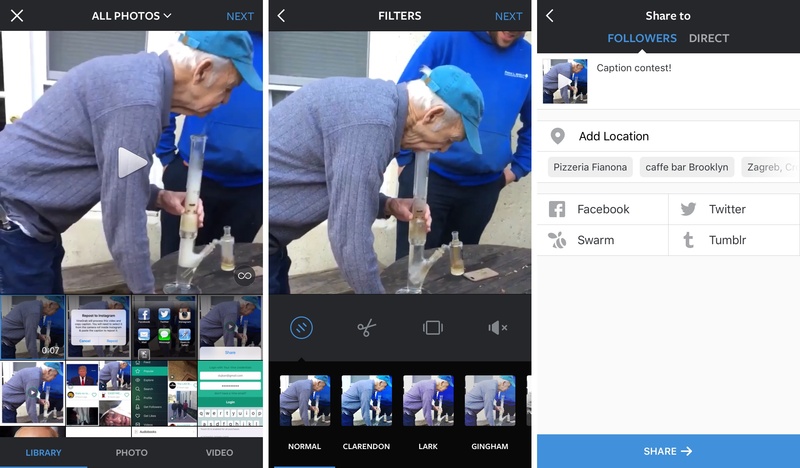 8) Provide a caption (use a long-tap to paste the description copied from your original vine), optionally add a location and tap Share to repost the video on Instagram. 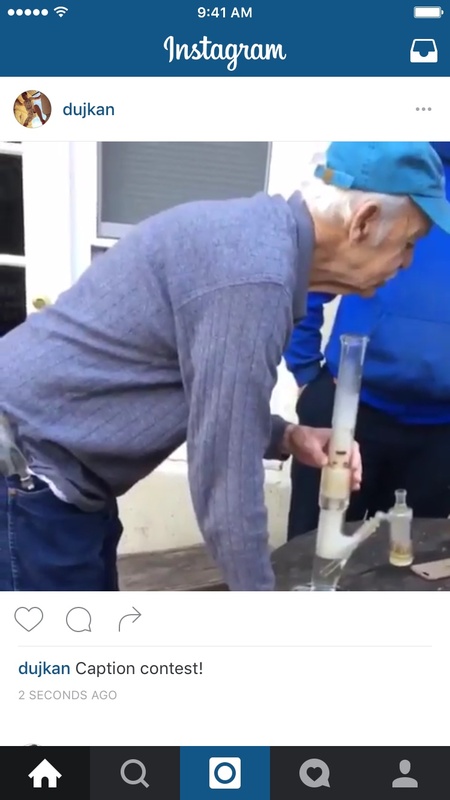 Your video will now be reposted on your Instagram profile. 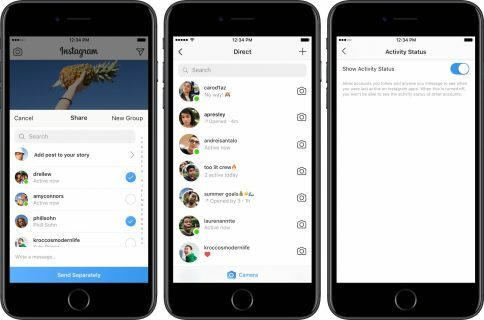 Tip: If you want to send a video through Instagram’s direct messaging feature, tap Direct at the top of the screen before sharing. Just to be clear here: Vine comments and likes won’t transfer over to Instagram. More articles about Vine can be found in our archives. As you can see for yourself, VineGrab’s interface looks a lot like Vine’s. 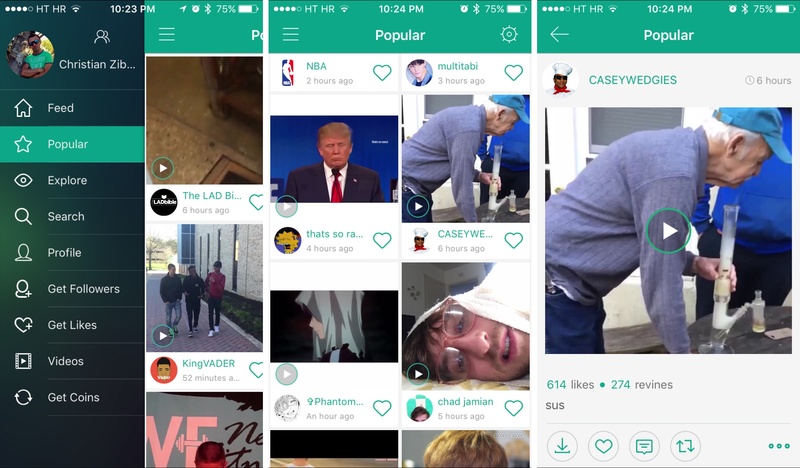 A number of advanced features are supported, too: you can like and revine vines, post comments, find something to watch by searching vines by people and tags, explore Trending and Editor’s Pick feeds, check out your own feed, browse friends’ vines, see vines by channels and more. It’s especially great that VineGrab permits you to add multiple Vine accounts so that you can switch between them when needed. VineGrab requires an iPhone, iPod touch or iPad with iOS 7.0 or later and is localized in English, French, German, Russian, Simplified Chinese and Ukrainian. A Pro edition is available as a one-time $9.99 In-App Purchase, which gets you unlimited coins, the ability to use multiple accounts and no ads. The app is available free of charge in the App Store.